John Maclean Jr., the son of America’s first professor of chemistry, was born in Princeton and served the College all his life. Princeton’s only bachelor president, he gave the time and energy a father ordinarily expends on his children to the students of the College, for whom he stood, quite literally, in loco parentis. He outlawed Greek fraternities that, in his opinion, had begun to have an injurious effect on campus life. Maclean added more distinguished scholars to the faculty, including Swiss geologist Arnold Guyot. As a general policy, he sought a balanced curriculum, believing there was a fundamental body of cultural studies that every educated person should be required to pursue before preparing for a profession. Just before the Civil War began, after Nassau Hall had been gutted by fire a second time, Maclean rallied alumni and friends to contribute funds toward rebuilding it. He augmented these funds by operating the College on an austerity budget during the war years, and helped liquidate the debt that remained by giving up part of his own salary. 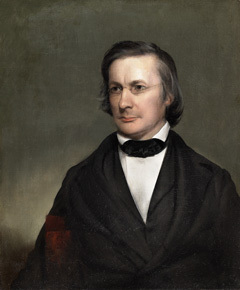 Although his main concern was the College, Maclean is credited with a major role in founding New Jersey’s public school system. The state legislature adopted his plan for a state normal school, local boards of education, and a nonsectarian common school system supported by public taxation. He also took an active interest in the state’s penal system. As a member of the New Jersey Prison Association, he sometimes walked 10 miles to Trenton on Sundays to conduct services in the State Prison. When he retired, Maclean wrote a two-volume history of the College. (Typically, he assigned the royalties to a fund “for the aid of indigent and worthy students engaged in seeking a liberal education.”) Since that history does not cover the years of his own administration, it does not mention the fact that he saw the beginning of baseball at Princeton; heard the first singing of the alma mater, “Old Nassau”; and voted to adopt orange as the official color of the College — soon to be joined with black. He never could have imagined that these colors would be carried to the moon a century later by Charles F. (“Pete”) Conrad ’53, commander of Apollo XII. John Maclean (1800–1886), Class of 1816.